One of my favourite concert presenters is Music Toronto, an organization dedicated to promoting chamber music in our city. It was at Music Toronto that I first heard Marc Andre Hamelin and Simon Trpceski, among others. And I've also heard plenty of singers over the years, singers who for whatever reason don't sing here often eough. This year, Music Toronto is bringing to town baritone Elliot Madore. Actually, he is a Toronto native, where he grew up in the western suburb of Etobicoke. I daresay most voice fans in Toronto have not heard him in person, for the simple reason that his career is almost exclusively outside Canada. Madore studied voice at Curtis Institute, won the Metropolitan Opera Auditions in 2010, subsequently became a member of the Lindemann Young Artists Program, sang at Tanglewood under James Levine, and then went on to Europe to build his career. 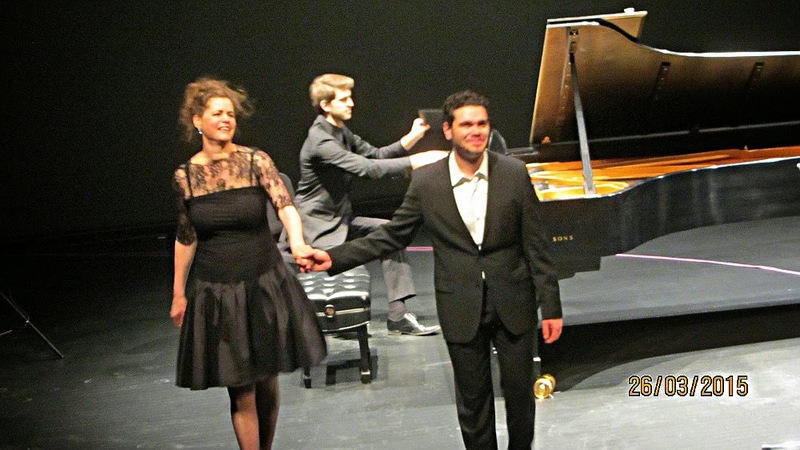 At the time of his Met Auditions win, I interviewed him for an article in La Scena Musicale - http://www.scena.org/lsm/sm15-9/sm15-9_madore_en.html Since that time, Madore's career has gone on a remarkable trajectory. He received great notices in The Enchanted Island at the Met, made his debut at Glyndebourne in L'heure espagnole / L'enfant et les Sortileges, and last summer, he sang the title role of Don Giovanni there. He is currently at Zurich Opera on a fest contract. This spring, he makes his Munich Opera debut in a new production of Pelleas et Melisande. There was a good crowd tonight at the Jane Mallett Theatre, with a large contingent of family and friends of the artist, based on the amount of cheering that erupted periodically throughout the concert. Madore began with Schumann's "song cycle" Liederkreis Op. 39. I put it in quotation marks because unlike other cycles, there's no true thematic thread running through the songs. The twelve songs are of course familiar to Lieder acifionados, particularly the exquisite Mondnacht and the ecstatic Fruhlingsnacht. Madore has a lovely lyric baritone with a recognizable timbre, even from top to bottom, capable of both power and nuance, with an impressive range, particularly an excellent top register. I can see why Pelleas is in his near future! I look forward to hearing him make his Munich debut in this role during this year's Festival. Tonight, he sang with a solid, virile, warm and ingratiating baritone that was a pleasure to the ear. 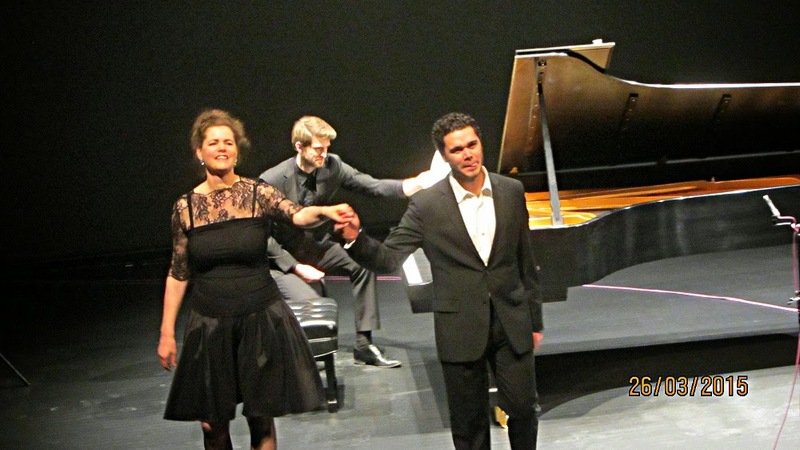 He gave unstintingly, delivering some of the songs in near-operatic fashion. This is not to suggest he's an insensitive artist - far from it. Throughout the song cycle, he gave the audience a full spectrum of dynamics. from solid fortes to lovely pianissimos. His attention to textual nuance was also impressive. One gets the feeling that this singer is extremely well schooled, with a solid technique, and abundant musicality. One can understand just from this cycle why he has managed to forge such an impressive career in a short time. After intermission, for a change of pace, he sang the five songs by Poulenc that makes up Banalites. I've heard this sung mostly by women for some reason, from Frederica von Stade to Canada's own Catherine Robbin. Madore sang well if occasionally a bit loudly in some of the songs, where a more half-voiced delivery would have been better, especially given the intimate size of Jane Mallett Theatre. The darkly humorous Hotel was given an appropriately languid delivery, however sans cigarette. He ended the formal part of the recital with five Ives songs, all "chestnuts" for Ives fans - a mix of fun and seriousness. Tom Sails Away was beautifully delivered, as well as the difficult Ich grolle nicht, with text by Heine, interestingly also set by Schumann in Dicterliebe, here beautifully rendered by Madore, I also enjoyed the very last song, Memories, often heard as an encore by visiting divas. It's not an easy song to pull off by a male singer, and Madore sang it well. Following a vociferous reception by some members of the audience - deservedly so I might add - Madore rewarded them with two encores. First was the very familiar "Deh vieni alla finestra" or Don Giovanni's serenade to Zerlina. Then it was an ebullient rendition of the Drinking Song from Ravel's Don Quichotte a Dulcinee. Madore did these two pieces full justice. 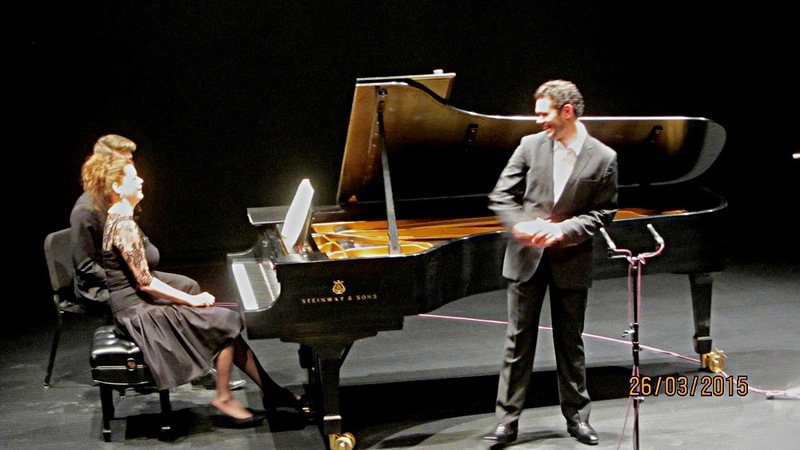 Throughout, Rachel Andrist was the model collaborative pianist, totally supportive of the singer. It was a most enjoyable end to a cold and snowy "spring" day.